Advanced Imaging Concepts - Digital Imaging Solutions for Pathology, medical imaging, clinical pathology, scientific image database, image archiving, and microscopes new and used. 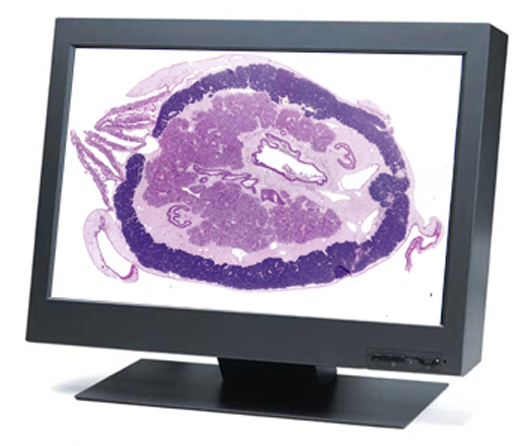 Advanced Imaging Concepts has been providing Digital Pathology Solutions to our clients since 1989. The blending of the Camera, Microscope, Scanner, Database/Imaging software has created for a wide variety of solutions for the Pathology Lab. AIC specializes in supplying state of the art systems. We can assist you in moving forward toward the Virtual Pathology Microscope. Steps taken can be as simple as upgrading older analogue NTSC video cameras and cumbersome frame grabbers to simple high resolution digital USB2/IEEE-1394 cameras which display the live image directly on your computer monitor. More elaborate solutions including a Networked version of our Image Central Database with interfaces to other systems in the Hospital or Lab, Robotic fully motorized microscope, Slide scanners for digitizing whole tissue mounts, TelePathology solutions for streaming live Digital video over your intranet either in a point to point secure solution or an IP broadcast configuration. We work with your existing equipment to meet your current and future needs while adhering to your budget requirements. Digital Imaging is powerful tool for today's Pathologist, yielding superior workflow over traditional methods. The Image Central software system integrated into your laboratory will manage a digital image collection by creating a streamlined workflow for capturing, archiving, and sharing images in presentations and reports. Common Pathology applications for images are made easy with the Image Central software. A standard use for captured images is for their safe storage and easy retrieval, especially for images that are used for reference, as standards, or to create a library of interesting cases. Image Central software pulls images directly from TWAIN Compliant cameras into a database that can be organized according to your lab's needs. Archived images make it very easy to search through thousands of records for all liver samples, taken with a 20x objective, stained with Masson's stain, and showing cirrhosis. Image Central makes it an easy task to organize and manage your images in an efficient and effective manner. Flexible report templates can also be constructed in MS-Word and images sent directly to them (along with database information, notes, annotations, microscope settings, etc) for the construction of a printed report to be appended to a Pathology report. Links can be set up with your existing system so that images in the Image Central database are automatically pulled into A/P reports with a single click or Image Central can pull in information from your LIMS/HIS system and create your finished Pathology report instantly. Please contact AIC for a discussion of your application requirements and we can show you how to take your Pathology Lab to the next level. Below some of the products that are well suited to the Pathology Laboratory. PathScan Enabler 5 - The PathScan Enabler 5 is the latest version of the patented PathScan series digital slide scanners. The original PathScan Enabler helped create the market for personal digital slide scanning over 20 years ago. With the new intuitive design, the PathScan Enabler 5 allows scanning of whole mounted histological samples attached to standard 1 X 3 inch cover slipped glass slides. The new optional GEOLOGICAL POLARIZING holder allows scanning of polished rock thin sections attached to 1 X 2 inch glass slides in both brightfield and polarized light! The PathScan Enabler 5 solves low power, large field of view, and high resolution imaging problems. Scan area is 24.3 x 36.5 mm, resulting in stunning, incredible images up to 14,320 x 9,522 pixels! The PathScan Enabler 5 holds two (2) 1 X 3 inch glass slides and includes simple to use software for both Windows and Mac computers. The GEOLOGICAL POLARIZING holder accepts one (1) 1 x 2 inch glass slide. Image files are saved in TIFF or JPEG formats. The PathScan Enabler 5 is designed not to replace but complement a microscope and digital camera. The entire sample is scanned with an even, clear background and makes a perfect OVERVIEW image that can be viewed in a variety of software programs. Image scans are equivalent to 50X microscope resolution. Now in its 20th year of production, thousands are in use! The New Generation PathScan Enabler 5 is a perfect compliment to any digital microscope imaging workstation. MediaPOINTE - DNS250 - The DNS250 offers up to 1600 x 1200 @60Hz input resolution streaming and an output resolution of the same high-resolution. The unit contains both an input and an output for computer graphic devices and can connect such devices over an IP network. The DNS250 can accommodate refresh rates up to 20 fps. Combined with high resolution digital camera systems from AIC the DNS250 provides the core for an efficient and easy to use TelePathology system. Proprietary encoding assures secure transmission of live video over your intranet, combined with progressive scan computer output, the system provides superb resolution. Please contact AIC for further information. MediaPOINTE - DMR200 - The DMR200 offers up to 1600 x 1200 @60Hz input resolution and an output resolution for streaming of 1024x768 @ 30fps. Provides the ability to simultaneously view live video from microscope slides with colleagues throughout your organization, ranging from people down the hall, on another floor, in a different building, or in a completely different location. All by using your own internal intranet. Provides for 1500 hours of recording time with local playback, download, and network streaming functions. Combined with high resolution digital camera systems from AIC the DMR200 provides the core for an efficient and easy to use TelePathology system. Need to confer with colleagues regarding a sample under the microscope? Need to discuss a slide with a specialist, but they are at another location hundreds of miles away? The DMR200 is the perfect solution with its ability to simultaneously record and stream any format source in standard MPEG-4 format from composite video to UXGA at high frame rates with Audio. Please contact AIC for further information. AIC - MT10011 - The two person microscope viewing table is 48" long x 32" wide x 29" high available with or with out heavy duty ball bearing locking casters. Also available as a hydraulic model for height adjustment. Available in various standard sizes to accommodate your microscopy needs. The maximum width of our standard table is 32 inches, nearly the maximum width still capable of fitting through a standard door frame. They feature a comfort contoured work area with our exclusive highly durable edge treatment. Sturdily built for a lifetime… using modern materials; featuring stain resistant laminate work surface and a powder coated steel frame made from 1.5 inch, 14 gauge steel tubing. Please contact AIC for further information. AIC - MT10041 - The three or four person microscope viewing table -- also used for Two side by side viewing -- is 65" long x 32" wide x 29" high avialable with or with out heavy duty ball bearing casters with brakes. Also available as a hydraulic model for height adjustment. Available in various standard sizes to accommodate your microscopy needs. The maximum width of our standard table is 32 inches, nearly the maximum width still capable of fitting through a standard door frame. They feature a comfort contoured work area with our exclusive highly durable edge treatment. Sturdily built for a lifetime… using modern materials; featuring stain resistant laminate work surface and a powder coated steel frame made from 1.5 inch, 14 gauge steel tubing. Please contact AIC for further information. AIC - MT10061 - The six station microscope table is 62" long x 27" wide x 29" high available with or with out heavy duty ball bearing casters with brakes. Also available as a hydraulic model for height adjustment. Available in various standard sizes to accommodate your microscopy needs. The maximum width of our standard table is 32 inches, nearly the maximum width still capable of fitting through a standard door frame. They feature a comfort contoured work area with our exclusive highly durable edge treatment. Sturdily built for a lifetime… using modern materials; featuring stain resistant laminate work surface and a powder coated steel frame made from 1.5 inch, 14 gauge steel tubing. Please contact AIC for further information. Rivulet Communications, Inc. - The IES-100 supports one real-time data flow and was designed with the enterprise in mind. Rivulet technology enables IP networks to replace T-1 private lines, move medical video around hospital networks, support video conferences with lower latency and higher resolution, Telepathology applications can be configured to an enterprises specific needs. Rivulet's sophisticated suite of algorithms guarantee real-time delivery of packets with zero packet loss due to router queue overflow. Hospitals and Pharmaceuticals can have colleagues at various locations all view the same slide on the microscope in real time. An operation in the OR can be monitored in real time from distant locations over standard IP networks. Proprietary encoding assures secure transmission of live video over your intranet the system provides superb resolution. Please contact AIC for further information. JENOPTIK - The NEW ProgRes Gryphax SUBRA series provides a multi-discipline and comparatively affordable microscopic imaging tool. The comprehensive innovative design concept results in a convenient graphical user interface, a functional software workflow and an elegant camera design with state-of-the-art USB 3.0 interface. The new PROGRES GRYPHAX® series will become an indispensable part of your laboratory providing high-quality and reliable solutions. PROGRES SUBRA camera refines every microscope workstation! Your microscope is not yet equipped with a camera? Your microscope camera needs replacing? You want to continue using your existing image analysis software? PROGRES GRYPHAX® provides you with an attractive solution for upgrading your workstation to a modern digital microscope station. Get the most from your microscope workstation! PROGRES GRYPHAX® cameras benefit from using optimum sensor formats for microscopy. In order to transfer the potential of your microscope to the camera, we recommend using the appropriate c-mount adapter for your system. Your local PROGRES trade partner will gladly help you to find the ideal solution for you! With Automatic & fast exposure control, Live Multifocus / Z-Stacking, Live Panorama / image stitching, Multi-Fluorescence, Video record Time-lapse / image series, Real-time histogram, Real-time image enhancements: sharpness, noise, dynamic, colors, Measurements with text annotations and arrow marking are just a few of the new features. See SPEC SHEET for further information. JENOPTIK - The ProgRes SpeedXTcore3 from JENOPTIK. ProgRes® SpeedXT core cameras for microscopy provide a new breakthrough in CCD Speed. USB 2.0 ProgRes® SpeedXT core 3 2080x1542 pixel CCD 1/1.8" the first to feature Jenoptik’s innovative SpeedXT core technology providing very fast live speed rates of 17 fps in full resolution. Due to the enhancement of the live image speed in combination with the high resolution the user is enabled to facilitate precise focusing and easy positioning of specimens without interlace effect in a more efficient way - a clear advantage in the analysis of moving objects and routine work in laboratories. Exposure times up to 180 s ensure optimum captured images, also under low-light conditions. The maximum possible color depth is 36 bit which provides superior color reproduction. An excellent color reproduction as well as ease of installation & operation are other distinguishing features of the cameras. The software can be easily and quickly installed, enabling users to immediately capture brilliant images in excellent, acknowledged Jenoptik quality providing finest color grading's for sophisticated applications. Reach your goal faster with >SpeedXT core - technology – faster installation, faster focusing, faster capture – in proven Jenoptik CCD quality! An excellent color reproduction as well as ease of installation & operation are other distinguishing features of the cameras. The ProgRes Capture Pro software suite included with the camera makes camera control even for the inexperienced user straightforward and simple. The powerful ProgRes® CapturePro software, features: automatic exposure control, fluorescence mode, focus tool, measurement function, recording of image sequences, annotations, shading options, individual storable user profiles, different languages, and multi focus. The Powerful Multichannel Acquisition provides the user the ability to manually acquire multiple fluorescent channels and automatically pseudo color and overlay the images. The ProgRes® Software can be operated as a Stand Alone application and as Twain PlugIn on both MAC and PC Platforms. JENOPTIK - The ProgRes SpeedXTcore5 from JENOPTIK. ProgRes® SpeedXT core cameras for microscopy provide a new breakthrough in CCD Speed. USB 2.0 ProgRes® SpeedXT core 5 2580x1944 pixel CCD 2/3" the first to feature Jenoptik’s innovative SpeedXT core technology providing very fast live speed rates of 13 fps in full resolution. Due to the enhancement of the live image speed in combination with the high resolution the user is enabled to facilitate precise focusing and easy positioning of specimens without interlace effect in a more efficient way - a clear advantage in the analysis of moving objects and routine work in laboratories. Exposure times up to 180 s ensure optimum captured images, also under low-light conditions. The maximum possible color depth is 36 bit which provides superior color reproduction. An excellent color reproduction as well as ease of installation & operation are other distinguishing features of the cameras. The software can be easily and quickly installed, enabling users to immediately capture brilliant images in excellent, acknowledged Jenoptik quality providing finest color grading's for sophisticated applications. Reach your goal faster with >SpeedXT core - technology – faster installation, faster focusing, faster capture – in proven Jenoptik CCD quality! An excellent color reproduction as well as ease of installation & operation are other distinguishing features of the cameras. The ProgRes Capture Pro software suite included with the camera makes camera control even for the inexperienced user straightforward and simple. The powerful ProgRes® CapturePro software, features: automatic exposure control, fluorescence mode, focus tool, measurement function, recording of image sequences, annotations, shading options, individual storable user profiles, different languages, and multi focus. The Powerful Multichannel Acquisition provides the user the ability to manually acquire multiple fluorescent channels and automatically pseudo color and overlay the images. The ProgRes® Software can be operated as a Stand Alone application and as Twain PlugIn on both MAC and PC Platforms. JENOPTIK - The ProgRes C3 from JENOPTIK. Incorporating Sony's ICX252AQ 1/2" Interline Transfer Color CCD with a 2080 x 1542 pixel array, with 3.45" x 3.45" pixels with on-chip color-mosaic-mask (RGB Bayer pattern) and Sony's HyperHad microlenses. The 3.3 million square pixel CCD sensor delivers highly detailed and sharp color images. The ProgRes® C3 is an easy to operate high-resolution digital camera for microscopy. Sophisticated technology combined with easy handling makes it a reliable and highly productive tool for Pathology Labs. With electronic shutter exposure times from 0.2ms up to 180s, 12 bit A/D conversion for 4096 distinct shades per color channel allowing recording of low contrast specimens, and an IEEE 1394 6 pin interface which provides for a single cable solution the ProgRes® C3 redefines what users should expect from economically priced cameras. The ProgRes Capture Pro software suite included with the camera makes camera control even for the inexperienced user straightforward and simple. The powerful ProgRes® CapturePro software, features: automatic exposure control, fluorescence mode, focus tool, measurement function, recording of image sequences, annotations, shading options, individual storable user profiles, different languages, and multi focus. The Powerful Multichannel Acquisition provides the user the ability to manually acquire multiple fluorescent channels and automatically pseudo color and overlay the images. The ProgRes® Software can be operated as a Stand Alone application and as Twain PlugIn on both MAC and PC Platforms. JENOPTIK - The ProgRes C5 from JENOPTIK. Incorporating Sony's ICX282AQ 2/3" Interline Transfer Color CCD with a 2580 x 1944 pixel array, with 3.4" x 3.4" pixels with on-chip color-mosaic-mask (RGB Bayer pattern) and Sony's HyperHad microlenses. The 5 million square pixel CCD sensor delivers highly detailed and sharp color images. The ProgRes® C5 is an easy to operate high-resolution digital camera for microscopy. Sophisticated technology combined with easy handling makes it a reliable and highly productive tool for Pathology Labs. With electronic shutter exposure times from 0.2ms up to 180s, 12 bit A/D conversion for 4096 distinct shades per color channel allowing recording of low contrast specimens, and an IEEE 1394 6 pin interface which provides for a single cable solution. The ProgRes Capture Pro software suite included with the camera makes camera control even for the inexperienced user straightforward and simple. The powerful ProgRes® CapturePro software, features: automatic exposure control, fluorescence mode, focus tool, measurement function, recording of image sequences, annotations, shading options, individual storable user profiles, different languages, and multi focus. The Powerful Multichannel Acquisition provides the user the ability to manually acquire multiple fluorescent channels and automatically pseudo color and overlay the images. The ProgRes® Software can be operated as a Stand Alone application and as Twain PlugIn on both MAC and PC Platforms. JENOPTIK - The ProgRes CF from JENOPTIK provides the Highest Image Quality in Color. Optimized for applications in exacting routine and research tasks. Providing outstanding color reproduction by utilizing Sony's best 2/3" ICX285AQ sensor CD sensor with a 1.4 megapixel array. The image data with each color channel digitized in 12 Bits, a combination of Analog and Digital gain, and excellent electronics guarantee optimal images for analysis and documentation in microscopy. The fast live image enables expeditious and smooth operation. The camera is designed to fit into any Laboratory. With IEEE1394 Firewire and standard C-Mount each microscope camera easily connects to any computer and microscope in the lab. The ProgRes Capture Pro software suite included with the camera makes camera control even for the inexperienced user straightforward and simple. The powerful ProgRes® CapturePro software, features: automatic exposure control, fluorescence mode, focus tool, measurement function, recording of image sequences, annotations, shading options, individual storable user profiles, different languages, and multi focus. The Powerful Multichannel Acquisition provides the user the ability to manually acquire multiple fluorescent channels and automatically pseudo color and overlay the images. The ProgRes® Software can be operated as a Stand Alone application and as Twain PlugIn on both MAC and PC Platforms. JENOPTIK - The ProgRes CFcool from JENOPTIK. The cooled microscope camera ProgRes® CFcool is perfectly suited for demanding imaging applications. Providing outstanding color reproduction by utilizing Sony's best 2/3" ICX285AQ sensor CD sensor with a 1.4 megapixel array. Brilliant electronics and analog gain guarantee the high dynamic range that lets ProgRes® CFcool cope with the high demands in low-light contrast methods in microscopy. The image data are digitized directly at the sensor with 14Bit per color channel. Providing High Sensitivity and Broad Dynamic Range, the CCD sensor is enclosed by a hermetically sealed capsule, which has been flushed with nitrogen. The cooling of the sensor is done with a peltier element, a heat sink and a fan, in addition the unique shape of the housing provides a method to keep the heat generating electronics away from the sensor. The ProgRes® CFcool can expose images up to 5 minutes and digitizes with 14bit per color channel. The ProgRes Capture Pro software suite included with the camera makes camera control even for the inexperienced user straightforward and simple. The powerful ProgRes® CapturePro software, features: automatic exposure control, fluorescence mode, focus tool, measurement function, recording of image sequences, annotations, shading options, individual storable user profiles, different languages, and multi focus. The Powerful Multichannel Acquisition provides the user the ability to manually acquire multiple fluorescent channels and automatically pseudo color and overlay the images. The ProgRes® Software can be operated as a Stand Alone application and as Twain PlugIn on both MAC and PC Platforms. JENOPTIK - The ProgRes CFscan from JENOPTIK. The cooled and Microscanning technology of the ProgRes® CFscan is perfectly suited for demanding imaging applications. Providing outstanding color reproduction by utilizing Sony's best 2/3" ICX285AQ sensor CD sensor with a 1.4 megapixel array. Brilliant electronics and analog gain guarantee the high dynamic range that lets ProgRes® CFscan cope with the high demands in low-light contrast methods in microscopy. Where smallest structures have to be reproduced in full detail, the microscope camera ProgRes®CFscan with 12.5 megapixel capability provides excellent resolution for informative image documentation and image analysis. The Microscanning 1.4 megapixel cooled CCD color sensor is enclosed by a nitogen-flushed capsule with a Peltier element, heat sink and fan to cool the sensor. The excellent electronics including analogue gain and 14 Bit digitization stand for best image quality in microscopy and macroscopy. The ProgRes Capture Pro software suite included with the camera makes camera control even for the inexperienced user straightforward and simple. The powerful ProgRes® CapturePro software, features: automatic exposure control, fluorescence mode, focus tool, measurement function, recording of image sequences, annotations, shading options, individual storable user profiles, different languages, and multi focus. The Powerful Multichannel Acquisition provides the user the ability to manually acquire multiple fluorescent channels and automatically pseudo color and overlay the images. The ProgRes® Software can be operated as a Stand Alone application and as Twain PlugIn on both MAC and PC Platforms. JENOPTIK - The ProgRes C14plus from Jenoptik. The cooled 2/3" c-mount CCD utilizing JenOptik's well proven Microscanning technique the basic resolution of the 1.4 megapixel (1360x1024) Sony ICX285AQ CCD is increased up to 12.1 megapixels (4080x3072) - utilizing CCSS (color co-site sampling) for real image information, true RGB colors, no interpolation. This is the Ultimate Pathology Camera! This, the latest model in the successful ProgRes series, is based on the technical know-how of the well-proven ProgRes 3012 camera. The continuous development process finally has resulted in an easy to handle digital microscopy camera that satisfies all demands from the microscopist's point of view. Nine programmable resolutions offer the appropriate frame size for all possible applications. The CCD sensor is sealed dust- and airtight and cooled by a two-step cooling mechanism: a combination of peltier cooling and an additional fan together with sophisticated capturing software allow for integration times up to 10 minutes. This makes the ProgRes C14plus the ideal tool for all low-light applications. The dynamic range of 66dB with a color depth of 42bits RGB registers brilliant images with the finest detail and color nuances. A fast live-image, automatic exposure and easy white balancing are just a few of the ProgRes C14plus's software features that facilitate your everyday work. From image capture and color adjustment up to image storing: the camera software provides helpful tools that allow you to capture the best possible images. The ProgRes Capture Pro software suite included with the camera makes camera control even for the inexperienced user straightforward and simple. The powerful ProgRes® CapturePro software, features: automatic exposure control, fluorescence mode, focus tool, measurement function, recording of image sequences, annotations, shading options, individual storable user profiles, different languages, and multi focus. The Powerful Multichannel Acquisition provides the user the ability to manually acquire multiple fluorescent channels and automatically pseudo color and overlay the images. The ProgRes® Software can be operated as a Stand Alone application and as Twain PlugIn on both MAC and PC Platforms. Lumenera - The INFINITY 2-1R newly engineered 1.4 megapixel scientific CCD camera offers a significant performance increase for quantitative and low-light applications over its predecessor. Reduced operating temperatures combined with a much higher dynamic range and 14-bit output have resulted in a versatile entry-level research camera. The INFINITY2-1R easily manages seconds of exposure time with a dark current rating of less than 1 e-/s. Superior Sensitivity: The INFINITY2-1R has a dynamic range of 64 dB allowing users to image unevenly lit samples without worry. The resulting images show detail in bright and dark areas not normally seen in lower dynamic range cameras. Advanced thermal management allows for long exposure times of several minutes without the need for a higher priced cooled camera. Full Image Analysis Software Included: INFINITY CAPTURE, an intuitive image capture program, and INFINITY ANALYZE, a full image analysis package offering; camera control, measurement, annotation, tiling and post capture enhancement, are both included. Camera and software combined to create a complete microscopy imaging solution for your application. USB 2.0 Plug-and-Play Interface: Sharing and installation of one or more cameras on a single computer is quick and simple through a high-speed USB 2.0 interface. Third-Party Software Integration: The INFINITY2-1R is available in color or monochrome, INFINITY cameras are supported by an experienced team of technical support and imaging experts. We understand your imaging needs and are here to help you get the most out of your camera. Product Highlights: Improved noise performance over first generation camera, Incredibly low dark current noise in an uncooled camera, High dynamic range of 64 dB, Low noise progressive scan 1/2" 1.4 megapixel Sony ICS205 CCD sensor, Selectable 10 or 14-bit pixel data modes. To many models to pick from? Call our image specialist's or check the Full Line Brochure! •Select 8 & 12-bit pixel data modes. To many models to pick from? Call our image specialist's or check the Full Line Brochure! Lumenera - The INFINITY 2-3 3.3 megapixel digital CCD camera is ideally suited for brightfield, darkfield, and DIC imaging applications where higher resolution archiving and a wide dynamic range are routinely required. With 2080x1536 resolution and on-board processing, the INFINITY2-3 delivers outstanding image quality for a wide variety of scientific applications. Live video preview provides for real-time focus while auto exposure and auto white balance efficiently capture your optimal image. An intuitive user application provides camera controls while full integration to popular third-party imaging applications is available through our TWAIN drivers. The USB 2.0 digital interface ensures a simple plug and play installation – and one standard cable minimizes camera clutter. Every INFINITY camera includes INFINITY ANALYZE software for advanced camera control, image processing, measuring and annotation, as well as INFINITY CAPTURE, an intuitive user interface which includes all of the basic features needed to control your INFINITY camera and capture images. INFINITY cameras are supported by an experienced team of technical support and imaging experts. We understand your imaging needs and are here to help you get the most out of your camera. Product Highlights: High-speed USB 2.0 interface for ease of installation on any computer, The low noise characteristic 3.3 megapixel CCD image sensor, Crisp color quality for the most demanding brightfield and darkfield microscopy applications including clinical pathology and cytology, histology, life science and geology, Full color sub-windowing allows for rapid focus and scanning of samples: 5 fps at full 2080X1536 resolution, Select 8 and 12-bit pixel data modes. To many models to pick from? Call our image specialist's or check the Full Line Brochure! Lumenera - The INFINITY 4-11 boasts excellent color rendition, making it ideal for life science, clinical, and industrial applications. Lumenera’s INFINITY4-11 digital CCD camera is based on the Kodak KAI-11002 11 megapixel sensor. Matching the large field of view of a 35mm camera, this USB 2.0 camera offers 3.5 frames per second at full 4008 x 2672 resolution, fast 60 fps through binning and ROI, and on-board processing for superior image quality. Live video preview provides for real-time focus while auto exposure and auto white balance efficiently capture your optimal image. A USB 2.0 digital interface ensures a simple plug-and-play installation. Capture high quality images through Lumenera’s INFINITY ANALYZE — an advanced image capture, measurement and processing software package that is included with your camera. The INFINITY4-11 can also be fully integrated with other third-party imaging applications through our TWAIN driver. A custom coupler engineered for all microscope models is available for the INFINITY4-11. This F-mount coupler allows you to take full advantage of this high resolution camera by ensuring that the entire 43mm field of view is visible. For more information please refer to the Large-Format Custom Coupler datasheet. The INFINITY4-11 is available in color or monochrome. The INFINITY4-11 camera is supported by an experienced team of technical support and imaging experts. We understand your imaging needs and are here to help you get the most out of your camera. Product Highlights: Large format 11 megapixel CCD sensor, Excellent sensitivity with high fidelity color reproduction, Custom coupler for all microscope models, Progressive scan with electronic global shutter, Ideal for the most demanding brightfield and darkfield microscopy applications, including clinical pathology and cytology, histology, life science and geology, 3.5 fps at full 4008X2672 resolution, 60 fps with binning and reduced preview resolution. To many models to pick from? Call our image specialist's or check the Full Line Brochure! Lumenera - The NEW INFINITYHD high definition CMOS color microscopy camera is a full featured, stand alone, high definition scientific imaging solution offering full 1080p60 preview with superb color reproduction and extremely fast frame rates streaming direct to monitor. Operate the camera by directly connecting to a monitor without connecting to a PC, or utilize the plug-and-play USB 2.0 image capture. With extremely fast response times, the INFINITYHD quickly reacts to lighting changes in any life science, clinical or material application. Video output over HDMI connector to either a DVI of HDMI monitor. 3 on-camera buttons allow easy access to power, white balance and image capture. Superior Color Reproduction: Years of experience in the microscopy market have allowed Lumenera to develop specialized color algorithms ensuring excellent color reproduction. This results in a sample preview on a monitor that closely matches the view on the microscope eyepiece. Full Frame Rates: The INFINITYHD camera provides the required 60 fps for true high definition, unlike many competitors professing to be HD but offering considerably lower frame rates. This allows for smooth manipulation on the preview without any lag. The included INFINITYHD software allows for image capture. The software is intuitive and can be set up in minutes. Once the camera is initially installed, the camera can run independently or used via the high-speed USB 2.0 connection. Superior Technical Assistance Center (TAC): As a Lumenera customer you gain access to the TAC group and knowledge base, which provide full support for cameras, software and microscopy applications. Product Highlights: 1/3" (16:9) CMOS 2 megapixel sensor, 1080p60 high definition format 1920 x 1080, Direct output to monitor, 3 on-camera buttons for power, white balance and capture. To many models to pick from? Call our image specialist's or check the Full Line Brochure! Optronics - MicroCastHD - Microcast® HD System is a versatile high-definition medical grade camera system that offers a 2-megapixel, progressive scan image at 60 frames per second. This small remote head c-mount digital camera houses state-of-the-art 3CCD HD image sensors and sophisticated embedded FPGA software technology designed to deliver unsurpassed resolution and color fidelity in real-time, automatically, in a variety of microscope imaging applications. It provides for a powerful stand alone, all-in-one high definition imaging solution that combines the unsurpassed image quality with powerful image capture capability found previously only in custom HD capture systems, HD capture cards and stand alone imaging appliances. Combined with revolutionary progressive scan MPEG-4 enhanced definition recording capability and it provides a revolutionary digital HD imaging solution which packs amazing performance and versatility into a simple and elegant package. Microcast HD System creates the ultimate cinematic microscope visualization, documentation and recording experience. This powerful camera system delivers superior color accuracy, detail and depth perception of microscope images at 60 frames per second. With embedded image capture, video recording technology and printer drivers, one can capture, record and print directly from the camera. Microcast HD has the unrivaled performance to adapt quickly to changing lighting and magnification conditions in all types of microscope applications including pathology and microsurgery. No complicated menus or ambiguous controls. The HD System is a drop-in replacement for older analog camera systems that instantaneously supercharges your microscope to full uncompressed 1080p Digital HD Video. Microcast HD is extremely easy-to-use and offers the Optronics® signature human interface providing intuitive and simple on-screen menus that every staff member can use with very little training. The Microcast HD is controlled using either a tactile remote control keypad interface or programmable head buttons conveniently located on the lightweight low-profile camera head. Do you love that high-definition color image you see on screen; the incredible depth perception, spatial resolution and color fidelity of your microscope images? With Microcast HD Studio, you can now capture and preserve all the stunning color and detail in easy to manage full high-definition JPEG still image files or record a progressive scan enhanced definition video in MPEG-4 format. The image and video files are saved directly to your compatible USB mass storage device. No computer or software is required! The HD System is available in 5 different configurations depending upon image capture and measurement requirements. The camera mounts easily on your microscope with a C-mount adapter and is the perfect choice for all your imaging applications. QImaging - Retiga R6 - The Retiga R6 provides a 6.0 MP platform that will fit more into your field of view. QImaging puts the right tool in your hands when the goal is fast, sensitive imaging and documentation in true plug-and-play fashion. It is ideal for time lapse, tile-and-stitch or stereo microscopy. The Retiga R6 has the technical features you need to improve limits of detection and quantification. More importantly, the camera becomes an intuitive extension of your imaging system, smoothly delivering data from the super speed USB3.0 interface to your computer. Inside the R6 camera, QImaging introduces Intelligent Quantification™ - on camera intelligence features that correct for defective pixels, remove accumulated dark current and make high dynamic range imaging available. Fast 50 MHz pixel digitization increases frame rates, providing high speed to manage pixel volume. A great camera deserves great software for acquisition. QImaging Ocular™ is QImaging's all new imaging platform that's included in every camera purchase and ready to become your go-to capture program. View the QImaging Ocular video! Featuring 75% peak QE combined with low noise electronics reveals the weak signals missed by industrial cameras, Increased exposure time and binning enables detection of the faintest signals with deep sensor cooling, 50MHz two port readout delivers frame rate for finding, focusing and imaging samples, Reduce photobleaching and phototoxicity on samples. Intelligent Quantification™ provides advanced real-time FPGA algorithms to deliver better image quality New QImaging Ocular™ imaging software. Intelligent Quantification™ provides advanced real-time FPGA algorithms to deliver better image quality. Please check the Software Compatibility Matrix to see whcih Q-Imaging Cameras are supported in all the most popular Software packages. QImaging - Retiga R3 - The Retiga R3 gives you a 2.8 MP platform that increases the quality of overview images, and is also capable of signal binning for work at high magnification or increased sensitivity. It is ideal for fixed or live, time lapse or slide scanning. The Retiga R3 has the technical features you need to improve limits of detection and quantification. More importantly, the camera becomes an intuitive extension of your imaging system, smoothly delivering data from the super speed USB3.0 interface to your computer. Inside the R3 camera, QImaging introduces Intelligent Quantification™ - on camera intelligence features that correct for defective pixels, remove accumulated dark current and make high dynamic range imaging available. Fast 50 MHz pixel digitization increases camera frame rate to give you all the speed you need for almost any laboratory imaging challenge. A great camera deserves great software for acquisition. QImaging Ocular™ is QImaging's all new imaging platform that's included in every camera purchase and ready to become your go-to capture program. Featuring 75% peak QE combined with low noise electronics reveals the weak signals missed by industrial cameras, Increased exposure time and binning enables detection of the faintest signals with deep sensor cooling, 50MHz two port readout delivers frame rate for finding, focusing and imaging samples, Reduce photobleaching and phototoxicity on samples. Intelligent Quantification™ provides advanced real-time FPGA algorithms to deliver better image quality. Please check the Software Compatibility Matrix to see whcih Q-Imaging Cameras are supported in all the most popular Software packages. QImaging - Retiga R1 - The Retiga R1 has the technical features you need in a scientific camera to improve limits of detection and quantification. More importantly, the camera becomes an intuitive extension of your imaging system, smoothly delivering data from the super speed USB3.0 interface to your computer. Inside the R1 camera, QImaging introduces Intelligent Quantification™ - on camera intelligence features that correct for defective pixels, remove accumulated dark current, and make high dynamic range imaging available. Fast 50 MHz pixel digitization increases camera frame rate to give you all the speed you need for any laboratory imaging challenge. A great camera deserves great software for acquisition. QImaging Ocular™ is QImaging's all new imaging platform that's included in every camera purchase and ready to become your go-to capture program. View the QImaging Ocular video! Featureing 75% peak QE combined with low noise electronics reveals the weak signals missed by industrial cameras, , Increased exposure time and binning enables detection of the faintest signals with deep sensor cooling, 50MHz two port readout delivers frame rate for finding, focusing and imaging samples Reduce photobleaching and phototoxicity on samples. Intelligent Quantification™ provides advanced real-time FPGA algorithms to deliver better image quality, New QImaging Ocular™ imaging software. Please check the Software Compatibility Matrix to see whcih Q-Imaging Cameras are supported in all the most popular Software packages. QImaging - MicroPublisher RTV - The cameras are available as Monochrome or Color in 3.3 MegaPixel or 5.0 MegaPixel configurations with FireWireTM IEEE 1394 interface and come with QCapture Software for high speed performance preview and capture functions. QImaging cameras will operate on both Windows and Mac based systems. A Software development kit is available for easy interfacing with custom software. QImaging cameras are compatible with a large selection of life science and industrial software for microscope, machine vision and video streaming applications. MicroPublisher RTV cameras provide high resolution still color images for publication or documentation in brightfield and fluorescence clinical, life science and graphic animation applications with video like, full field of view frame rates of up to 30fps for faster focusing. The new QCapture Pro7 imaging software is also optionally available. Toshiba - IK-TF5 - 3-CCD Progressive scan RGB VGA camera. This compact one piece camera with 1/3" sensors is ideally designed to capture high resolution color images and output directly to a computer monitor or projector. Image-jitter is eliminated through the use of Progressive Scan CCDs and the standard VGA output. Drive large Plasma or LCD screens without the need for a computer. Ideal for Hospital Conference rooms, high resolution Direct Digital, fast and easy to setup no computer required. The IK-TF5 also has a Partial Scan mode that can output 180 frames per second for high speed events common in machine vision applications. Toshiba - IK-TF9 - 3-CCD RGB Progressive scan camera with 2048x1536 resolution with 4.65 micron square pixels. The IK-TF9C camera is designed for easy integration into any machine vision system that requires high resolution and precision color definition. This new 3-chip, color CCD camera is one of the smallest and lightest 3CCD color cameras available making it a perfect solution for Pathology systems that require the precision and high color fidelity that only 3CCD technology can achieve. This compact one piece camera is ideally designed to capture high resolution true color images in which image-jitter is eliminated through the use of Progressive Scan CCDs. Proprietary prism block assures accurate alignment of all three sensors for the life of the camera. Camera Link output provides 20fps display at full resolution. Toshiba - IK-TU51 - Toshiba's first 3-CCD RGB Progressive scan remote head camera offered with digital output and a choice of 1/3 inch or 1/2 inch image sensors. With LVDS Digital and Analog outputs, Toshiba's advanced expertise in miniature 3CCD prism technology enables the smallest, lightest 3CCD color camera systems available today. It is ideal for applications such as Pathology where precision color is critical. Utilizing 6 vector color processing and frame memory for continuous integration, with high sensitivity makes this camera an ideal choice for microscopy and other imaging applications. Compatible with standard frame grabbers from a variety of manufactures, contact AIC for further information. VisTek - The VIP320 and VIP3200 Series Tabletop Vibration Isolation Platforms are passive, mechanical and robust. They do not require compressed air, or complicated algorithms associated with semi or fully active, piezzo electric vibration control systems. The products are small, efficient and maintenance free while maintaining complete system integrity. The VIP300 Series consists of standard, rectangular shaped platforms with 3 or 4 VIB320 bearings for isolating microscopes and other sensitive instruments. The VIP3200 Series are custom shaped vibration isolation platforms designed for a specific microscope brand and model number. All the products provide Exceptional six degrees-of-freedom isolation. Tangential, and secant compliance. and Fast settling times. The Horizontal Isolation provided by a horizontal, non-linear spring results in isolation that is constant and independent of the frequency and amplitude of the input vibrations. As a result, the horizontal spring filter whites out or filters out a broad band of input frequencies and insures a constant level of vibration transmission reduction. With Vertical Isolation accomplished via Broadband filtering with substantially non-linear spring filters. To view the our Brochures and PDF files you need to have Adobe Acrobat Reader installed on your computer. If you do not already have Adobe Acrobat Reader installed, click on the Get Acrobat Reader button for instructions on how to download a free copy. © Copyright 2018, Advanced Imaging Concepts Inc.